For the whole of September I only bought coffee from small independents. So no Starbucks, no Costa Coffee and no Neros … and so on! The initial idea for this came when my girlfriend Claire and I had a delicious ‘flat white’ from Campervan Coffee Company in the garden of Hitchin’s Vic pub back in the Spring, but it took me until September to go fully “independent” once I’d stumbled across an Instagram image bigging up visiting small businesses rather than lining the pockets of another multi millionaire CEO. Let's leave aside the hectoring, sanctimonious faux-economics of turning 'multi-millionaire CEOs' into sneering pantomime villains, for a second. (That is probably a topic which deserves its own post here.) I was intrigued. I like good coffee. I like supporting small, independent businesses (I am one myself, after all). I like the idea of doing things which are a little recherché. But the more I read of Biggs' article, the more I felt myself filling up with a cold, uncomfortable sense of inadequacy; I'm sure that wasn't Biggs' intention when writing the piece, but by the end I was feeling pretty miserable about myself, and about my lifestyle. Y'see, I simply don't feel like I am able to visit only independent coffee shops for a month. Does that make me a bad person? I might visit one, occasionally, as a treat. But that's all it ever can be. No, I am stuck – trapped in my inferior life of low-quality coffee from chain stores, consumed 'on-the-go' rather than savoured during a well-earned break. I like coffee, but I rarely get the chance to sit down and enjoy it without anything else going on. 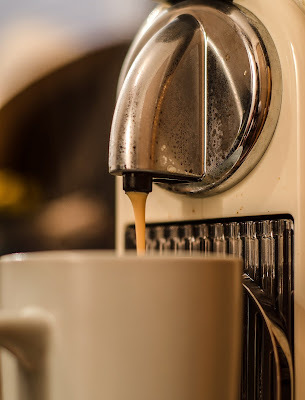 I work a lot, and often at strange times of day – I find I tend to grab a coffee when I can, often when traveling between one bit of work and the next. I have a Nespresso machine in my studio, which I love, and makes working from home considerably more enjoyable; but in general, I have to organise my coffee drinking habits around my working day – I don't have the luxury of arranging my working day around enjoying a nice cup of coffee. This thing keeps me alive when I'm working in my studio. Small, independent coffee shops are lovely places. But they are often difficult to get to, in town centres, where parking is difficult – not close to where I live, or where I'm working – and only open during traditional 'business hours'. All of this makes them, sadly, rather inconvenient. You get to sample so many more flavours from the many different bean varieties stocked by the independent traders. It feels good when you support a small business and it gives you a warm feeling inside: in this case literally. Sometimes you may want “some coffee with your coffee” with cup sizes being on the small size compared to a sizeable grandé from Starbucks! But then that’s the great thing about having the choice. When you fancy a large coffee just grab that grandé Starbucks instead. Value for money isn’t necessarily about the amount of coffee you receive though. One establishment worked out to be 3x more expensive than a Starbucks latté per ml but if you’re getting over 3x the enjoyment in nicer surroundings then it’s money well spent. Purposely grabbing a coffee most days for the month turned into an expensive little exercise but it gave me a much better idea of what I like and where my favourite places are. After a while I had to walk further and further to find new places so at that point I simply ended up going back to a few shops repeatedly, but then that’s how you become a regular somewhere. Oh and “independents” pay their taxes of course! Apart from yet another sly dig about 'tax avoidance', I couldn't find anything there to disagree with. But it is undoubtedly a pipe-dream piece, written from a position of privilege. Like a gap year student extolling the magnificent virtues of 'taking time out to find oneself' to those of us who haven't the luxury of such self-indulgence, Biggs' (no doubt well-meaning) tone grates and ends up sounding smug. I wish I could afford to luxuriate in independent coffee shops, or artisan bakeries, or art galleries, museums, or any other sophisticated places of culture; to take time out of my day and enjoy the finer things in life; to get on my high horse about other people's tax affairs instead of fretting over how I'm going to afford my own… But I can't – and instead of feeling inspired, I ended Biggs' piece feeling bad about myself, rather than feeling good about independent coffee shops. "Pastrami, Emmental and mustard dressing, spinach, gherkins, sauerkraut on rye bread"
"No mayo" boasts the packet of this low fat sandwich from Marks & Spencer. That's no bad thing – I don't regard mayonnaise as the evil the calorie-counters do, but regular readers will know I deplore the overmayonation which blights so many of the sandwiches we buy. Unfortunately, when M&S took out the mayonnaise, they also took out the flavour. This recipe promised so much – I had expected the mustard dressing, the gherkins and the sauerkraut all to be strong-tasting and make their presence known, but sadly it wasn't to be. I am hesitant to say that this disappointing blandness is simply a feature of "low fat" recipes which is simply to be expected, as I don't think generalisations are helpful in reviewing sandwiches, but if this example is representative of the genre then the outlook is not good. I shall try not to let this prejudice me, and put me off trying other calorie-conscious sandwiches, but I shan't be buying this particular sandwich again. "Aberdeen Angus beef, red onion chutney & mustard on soft white farmhouse bread"
An interesting and bold recipe choice from this premier Marks & Spencer sandwich. What I will firstly say is that quality of the ingredients is very high, which instantly makes for an enjoyable sandwich experience, and really makes you feel like you are eating quality. 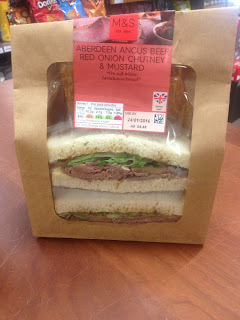 I was unsure, if I am honest, about how the combination of red onion chutney – which is traditionally quite sweet – and mustard would play out as a backdrop for Aberdeen Angus beef. I would have expected a sweet onion chutney to be paired with something like a strong, tangy cheese, perhaps. Mustard was an unusual choice. It worked better than I expected it would, as an overall recipe. But I don't feel it really grabbed me. It was fine – but it didn't sparkle. 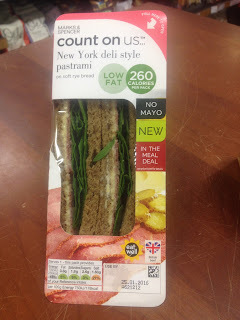 I think the jury's still out on this recipe, so I would buy this sandwich again to give it another chance, but unless I become a late convert to the idea I think maybe red onion chutney and mustard in one sandwich is possibly an innovative combination too far for Marks & Spencer.